The battery life of cell phones just doesn’t seem to be as long as it used to be. 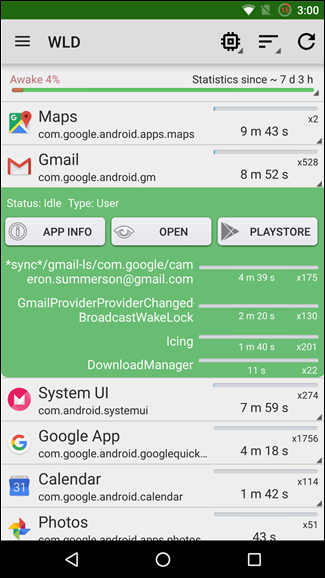 If your Android device is dying faster than you would like, Wakelock Detector can help you to home in on apps you have installed that might be killing your battery or preventing the screen from switching off. You will, unfortunately, need to be rooted in order to use this app—there is no easy way to see this information without root access. We have looked at some of the ways in which you can track down the source of battery problems, and Wakelock Detector is a free app that can be used to track down those apps and services that are causing your battery to deplete. 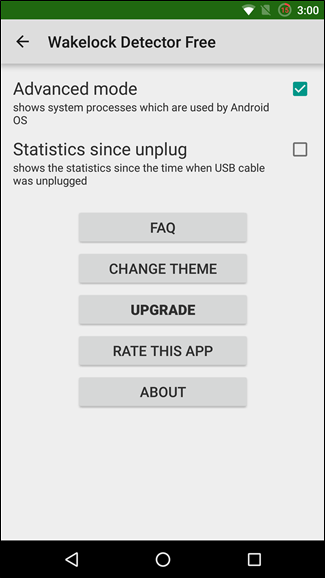 Android itself can provide some information about how your battery is being used, but it does not reveal anything close to the full picture. It’s important to remember that wakelocks in themselves are not necessarily a bad thing. They occur to prevent apps from being cleared out of memory so that it can keep running in the background – so email can be checked when your screen is turned off etc – but not all apps are well behaved. There are two different types of wakelocks to consider. 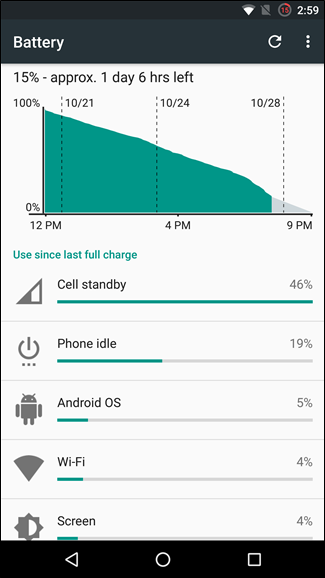 Partial wakelocks occur when an app or service continues to make use of CPU time but does so in the background, but full wakelocks mean that the screen is either turned on or prevented from turning off—which can obviously be a huge battery drain. Head over to Google Play and install yourself a copy of Wakelock Detector. It’s a good idea to install the app and continue to use for phone as normal for a while—perhaps carrying on as you do usually for a day or so. This will give the app a chance to collect a reasonable amount of data about the activities of your phone. The button to the right of this can be used to change the order in which apps are listed. The available options are running (ordered by how long apps have been active), Usage (ordered by resource usage) and ABCD (ordered alphabetically). Whether you’re looking at full or partial wakelocks, you can gain extra insight into what is going on with your phone by tapping any of the apps that have been highlighted. For example, if we select Google+, we can see that the app is waking up the device to sync and for the chat feature. Tapping App Info enables you to view details such as the amount of space the app in question is taking up as well as giving you the option of forcing a shutdown. The Open and Playstore buttons open the app and the relevant page of Google Play respectively. 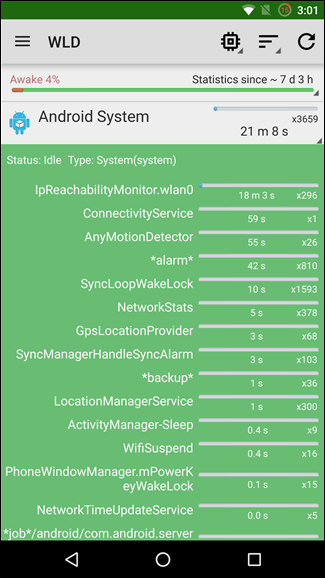 Next to each type of wakelock you can see how many instances there have been. 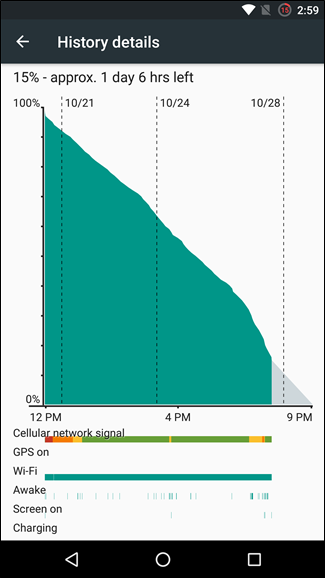 This is a great way to determine which apps, or which features of particular apps, are causing the battery to die. 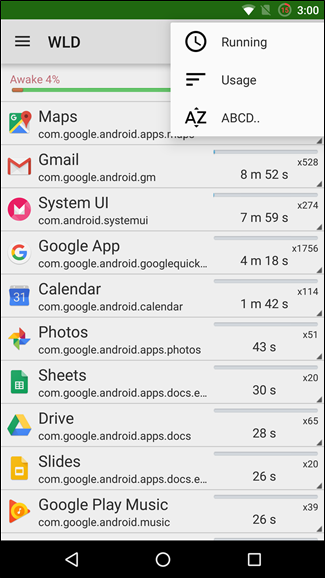 It can help you to decide whether an app that eats through your battery is worth the price, and help you to see which setting might need to be adjusted to help bring things under control a little. In the worst case scenario, you may find that it highlights a troublesome app and decide that it makes more sense to seek out an alternative. 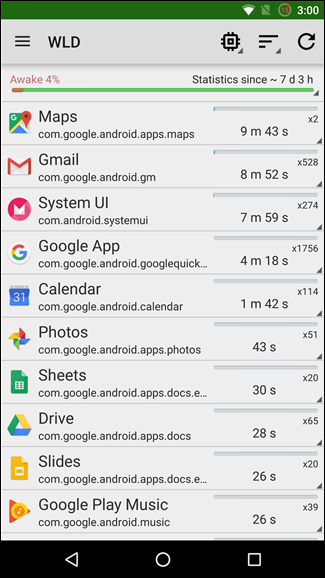 If you like to experiment with different ROMs, Wakelock Detector can also be used to track the battery usage of different system components. Open the menu by tapping the three dashes in the upper left corner, hit Settings, and then enable the “Advanced mode” option. Basically, Advanced mode allow WLD to show system processes alongside apps you’ve installed. 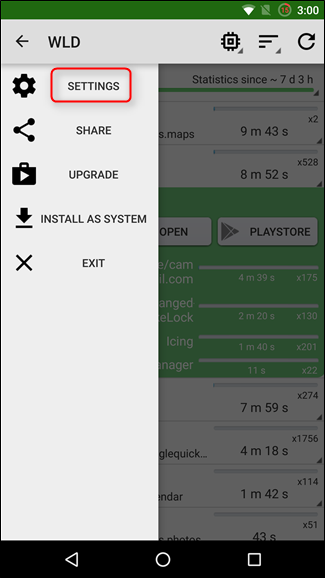 While you are not necessarily able to uninstall all of the components that are found to be keeping your phone awake, Wakelock Detector will highlight problems with a ROM that may help you to decide to try another one, or to disable a particular feature of the ROM. As always, Google is your friend. Should you notice that a particular app or service is waking up your device more than seems acceptable, check online to see if other people have been experiencing the same issue. As suggested in the app’s FAQ, just Google ‘[appname] wakelock issue’ and you may find the help you need.